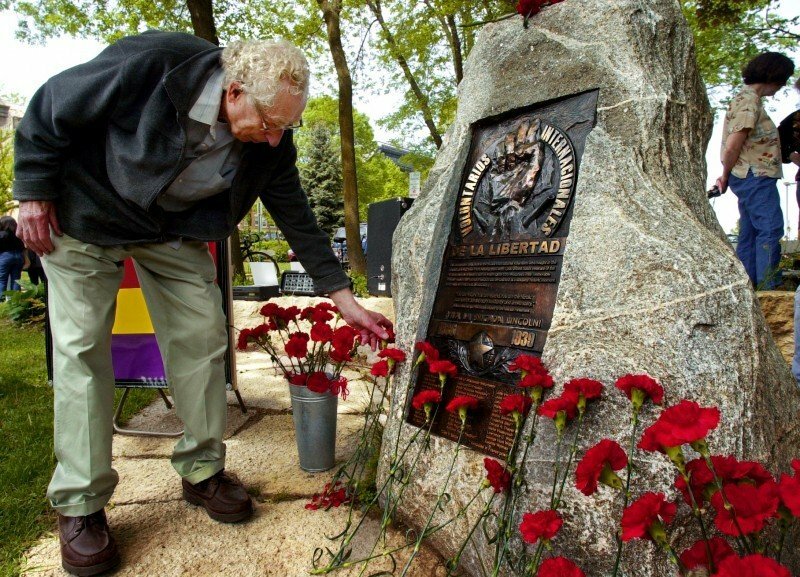 Spanish Civil War veteran Clarence Kailin places a red carnation at the memorial to Wisconsin volunteers who served in the Abraham Lincoln Brigade in a Memorial Day ceremony at James Madison Park in 2002. 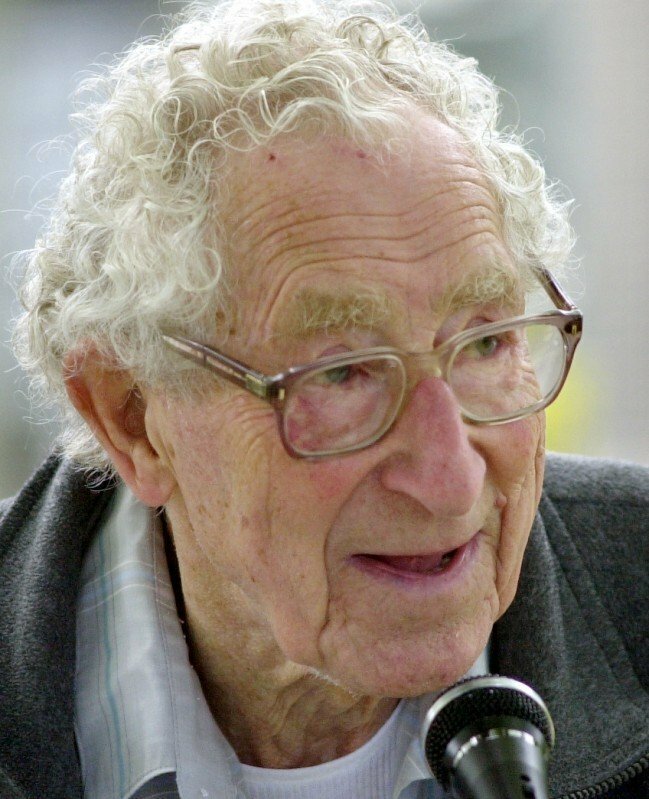 Clarence Kailin, a son of Madison whose lifelong commitment to social and economic justice led him to become one of the first Americans to take up arms against the fascist forces that swept across Europe in the years before World War II, has died at age 95. He is seen here in 2002. Clarence Kailin, a son of Madison whose lifelong commitment to social and economic justice led him to become one of the first Americans to take up arms against the fascist forces that swept across Europe in the years before World War II, has died at age 95. Kailin was one of the last of the 2,800 American volunteers who fought from 1936 to 1939 as the Abraham Lincoln Brigade in defense of the elected Spanish government against a coup engineered by Generalissimo Francisco Franco with the backing of Germany's Adolf Hitler and Italy's Benito Mussolini. His role in "the good fight" of the international volunteers -- as it was immortalized by Ernest Hemingway and W.H. Auden -- gave Kailin, a scrawny kid from Madison's multi-ethnic Greenbush neighborhood, a place in an essential chapter of 20th century history. Yet, for Kailin, "There wasn't any choice. If you were against totalitarianism, if you were against injustice, you had to care about what happened in Spain. Spain was where the fight against fascism was focused in 1936. So Spain was where I knew I needed to be." The years that Kailin spent fighting in Spain prior to the start of World War II would eventually earn him international recognition and praise as an iconic figure on the American left -- the Madisonian's courage and commitment were recently celebrated in song by folksinger Si Kahn and a section of the latest book by Democracy Now's Amy Goodman is devoted to him. The Spanish government recently made him a citizen of the country, where his visits in recent years have been greeted with hero's welcomes. But Kailin never wanted to be an old soldier telling stories of distant battles. He remained politically active to the last days before his death on Sunday, one day after he suffered a stroke. On Aug. 23, hundreds of family members and friends celebrated Kailin's 95th birthday with a party at the Gates of Heaven Synagogue that featured a hip-hop performance, international visitors and, of course, political speeches calling for an end to the wars in Afghanistan and Iraq, for single-payer health care and for a reordering of the U.S. economy that would tip the balance away from Wall Street and toward Main Street. Quick-witted and passionate to the last, Kailin laughed with his friend and comrade Bob Kimbrough -- as only old socialists could -- at the notion that a centrist Democrat from Chicago named Barack Obama was somehow turning the United States hard to the left. "If only Obama was a socialist!" Kailin mused. "But, you know, real change never comes from the top. It comes when people get organized and decide that they're going to make the change happen -- no matter who the leaders are." That was not just rhetoric. Kailin lived his politics. As soon as he returned from the fight in Spain, Kailin got busy organizing workers into union locals, marching to integrate schools and housing and pressuring the Wisconsin Department of Public Instruction to add African-American historical and cultural texts to the curriculum. (The department eventually published and circulated a teaching guide he developed.) Active for many years with the American Communist Party and then with the Socialist Party -- he founded Madison's monthly "Socialist Potluck" -- Kailin was a classic homegrown radical who demanded that the United States make real promise of "liberty and justice for all." That did not make his life an easy one. As his daughter Julie recalled in her 2002 book Antiracist Education, "My father, Clarence Kailin, has always been devoted to antiracist causes. He fought as an antifascist in the Abraham Lincoln Battalion, one of the international brigades of the Spanish Civil War (1936-39), a 'premature antifascist' as F.B.I. director J. Edgar Hoover was said to have put it. After returning from Spain, my father, like other veterans of that war, was considered 'persona non grata' by the U.S. government. He was harassed by the F.B.I. ; his employers, friends and neighbors were 'visited' by them; and they made a point of interfering with any job opportunities. For most of my childhood, my dad worked on and off as a free-lance janitor. When white men wearing suits came to our door, I knew they were not our friends." Eventually, Kailin found steady work at the University of Wisconsin, using his skills as a photographer and photo technician. But his real work, especially in the last decades of his life, was the struggle to radically redirect U.S. foreign policy. A militant foe of the Vietnam War and of U.S. interventions in Central America in the 1980s, Kailin threw himself into the struggle to prevent the invasion of Iraq. After the war began, he was a stalwart backer of the successful effort to have the city of Madison go on record -- in an overwhelming referendum vote -- for immediate withdrawal from that conflict; anyone who shopped at the Jenifer Street market during the months before the referendum was qualified for a place on the ballot recalls Kailin sitting by the door and soliciting petition signatures. Kailin, for whom the Madison Veterans for Peace chapter is named, had no taste for war. But he was not quite a pacifist. He believed there were times when it was necessary to fight. What irked him was a sense that his country often fought the wrong battles, or came to the right ones too late. "The United States should have backed the Spanish people against Franco," he said. "The reason we had to sneak into Spain as volunteers was because the U.S. government refused to get involved. They remained neutral, even though it was obvious to anyone who was paying attention that Franco was aligned with Hitler and Mussolini. We knew that if we didn't fight the fascists in Spain, they would keep grabbing other countries. And, of course, they did. It led to World War II. But even when we were proven right, the politicians in Washington never admitted it; they called us 'premature antifascists.' Well, you know what? I can't think of a more honorable name than that one." Kailin went to Spain as one of roughly two dozen Wisconsinites, most of them Jewish, all of them leftists, who traveled with passports stamped "not valid for travel in Spain" across the Atlantic, through France and ultimately over the mountains into Spain. There, they joined with the international brigades that fought side-by-side with loyalist Spanish forces in brutal battles with fascists who were armed by the Germans and Italians. Though they were outgunned and outnumbered on the battlefield, Kailin and his comrades relished the fight. "I was a member of the Communist party here (in Wisconsin), as many were. We understood the implications of the war in Spain," he explained in an interview years later. "We knew who Hitler was, we knew what fascism was. We knew what anti-Semitism was; I'm Jewish. Here was a chance to go over there and fight back." John Cookson, a rural Wisconsinite who was Kailin's best friend, died in Spain, as did roughly half of the U.S. volunteers. Kailin was badly wounded in battle but made it home alive. And amid all his other activism, he dedicated himself to recalling the comrades with whom he fought. It was a lonely struggle at first, but over time historians began to reveal the story of the courageous "Lincolns" and their premature antifascism. By 1999, when hundreds of fans cheered Kailin as he dedicated a monument in James Madison Park celebrating the Wisconsinites who fought and died in Spain, he was lavished with praise. Madison Mayor Sue Bauman issued a proclamation the memorial in James Madison Park. The state Assembly and state Senate issued citations. Congresswoman Tammy Baldwin entered a statement in the Congressional Record. A "Citation of Special Recognition" came from the office of U.S. Senator Russ Feingold. It would have been easy for Kailin to rest on his laurels on that sunny Sunday in 1999. Instead, he reminded everyone that "they shouldn't see this as a memorial to old soldiers. They should see it as a reminder that the struggle we joined in Spain, the struggle for economic and social justice, goes on. We're still a part of it." That was how Clarence Kailin saw himself, as a part of a movement for economic and social justice that began before his birth and that will extend beyond his death. But what a remarkable part he played. The great Spanish radical Dolores Ibárruri, La Pasionaria, told the international brigades as they withdrew from Spain in late 1938: "You can go with pride. You are history. You are legend. You are the heroic example of the solidarity and the universality of democracy." Those words, uttered more than 70 years ago, when Clarence Kailin was a young idealist fighting fascism in Spain, were the ones he chose to emblazon on the monument to the Wisconsin volunteers of the Lincoln Brigade. They remain his most fitting epitaph. Funeral and memorial arrangements are pending. A memorial service for Clarence Kailin will be held at 6:30 p.m. Saturday, Nov. 21, at the First Unitarian Society, 900 University Bay Drive.